how do i change my name on my account ? Please Note: Changes to your display name may take up to 24 hours to propagate throughout all of Second Life's systems. A club scene showing usernames and display names is illustrated at left. In this image, some usernames are blurred. Notice that only the username is shown above avatars who haven't set a display name. 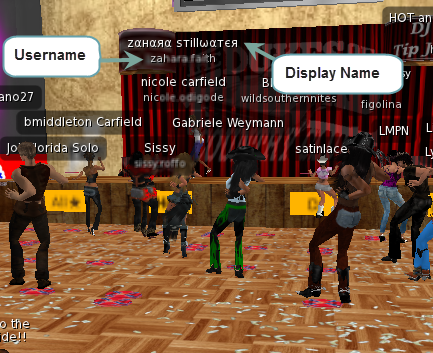 A name you choose shown to other avatars in the Second Life virtual world. A string of characters up to 31 characters long that contains at least one alphanumeric character. It can include most Unicode script characters, spaces, and some punctuation. 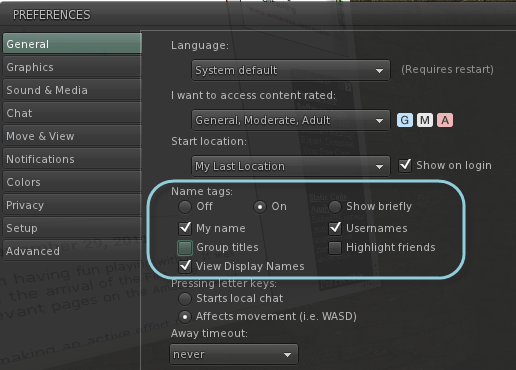 You can choose whether or not to show other Residents' display names and usernames inworld. If you choose to view display names or usernames, they appear in the name tags above every avatar and in chat. You can change your display name once every seven days, but you can Reset It at any time, which makes it appear as your "classic" Second Life first name and last name, or your username. In the Second Life Viewer, click Me > Profile... or in the toolbar. To reset your display name to its default (the same as your username) in the Edit Profile page, click Reset. Where your.user.name is your username. Note: Changes to your display name may take up to 24 hours to propagate throughout all of Second Life's systems.